I have always had an interest in creating my own personal care products after our youngest daughter turned out to be allergic to so many products as a baby. With her pale skin and red hair, the doctor told me that because of these traits she was at a higher risk to have sensitive skin. I am not sure how true his statements were but I do know that my daughter now 13 has had a horrible time with reacting to personal care products. The Aromatherapy Beauty Guide with my already large supply of essential oils and carrier oils in my house made it very easy for me to start to create my own natural personal care products. That being said I found with most of the recipes you didn't need to have a lot of oils to get started you could only have one or two oils and that would be all you would need for some of the recipes. 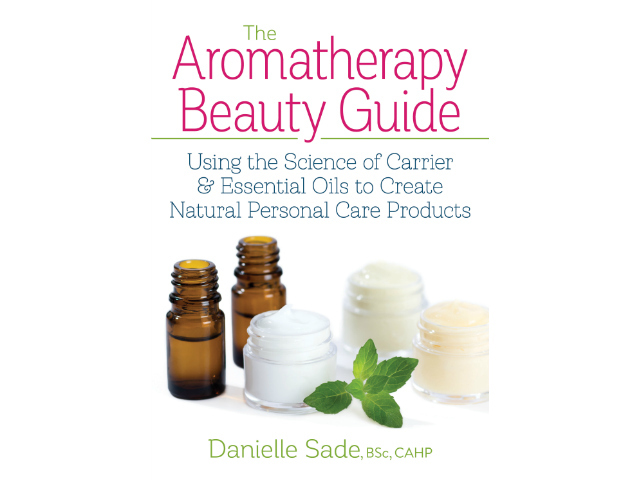 Courtesy of The Aromatherapy Beauty Guide: Using the Science of Carrier and Essential Oils to Create Natural Personal Care Products by Danielle Sade © 2017 www.robertrose.ca Reprinted with publisher permission. Available where books are sold. She's passionate about sharing the sound scientific basis upon which aromatherapy is built and making this invaluable information available to everyone. The aromatic molecules of a plant not only have the power to shift the way you feel but the essential oils from plants also have powerful therapeutic properties. It's the dynamics of these therapeutic actions that form the foundation in Danielle's successful approach to skin care. Danielle was also inspired to write this book because she herself has experienced skin sensitivities that didn't improve even after visits to skin specialists and conventional therapies. When the symptoms didn't subside, she took matters into her own hands and sought out a natural-medicine healing approach through essential oils. Making your own natural botanical creams and lotions is surprisingly simple and very satisfying – you'll soon be on the road to recovery and living a more natural lifestyle. Includes information on everything from anatomy of the skin, the all important mind-body connection, the nature of skin types from dry and sensitive skin to combination and aging skin as well the art of skin care and creating your personal skin care apothecary -- all without chemicals and preservatives -- just the tried and true chemistry of essential oils. Information on all the raw ingredients you'll need to get started (clays, flours and grains) as well as comprehensive information on the important role of carrier oils. Danielle discusses the essential properties of 16 carrier oils like Coconut Oil, Jojoba, and Marula Oil. Plant butters such as Shea butter as well as herbal infusions are also featured for their healing and therapeutic properties. Do you use essential oils? Have you used them to make your own beauty products?